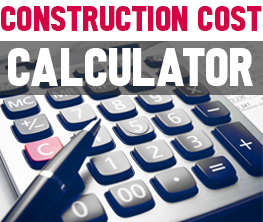 With Halloween just a few weeks away, this is a good time to start planning your decor. Whether you intend to give your home a few spooky touches or you are planning an office party and need a few fast decor ideas, here are some options. If you are one of those who can’t wait to put up their Christmas tree every year, make the wait easier with a Halloween tree. 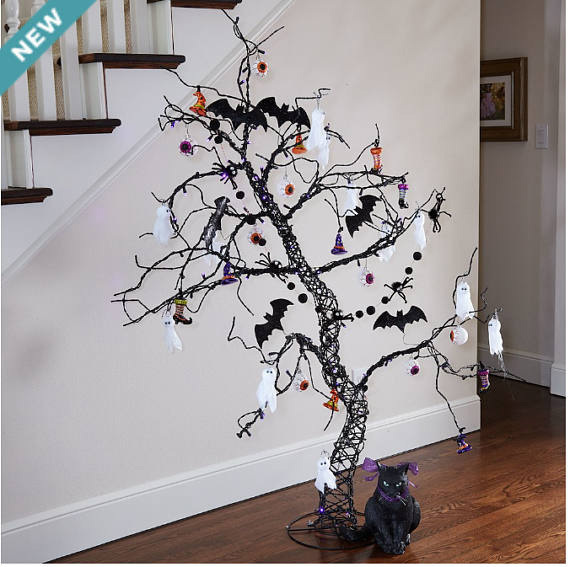 Lined with LED bulbs and a few glittering bats, this tree can serve as a fitting background for your handmade Halloween decor or even as a gathering place for scary storytelling at night. 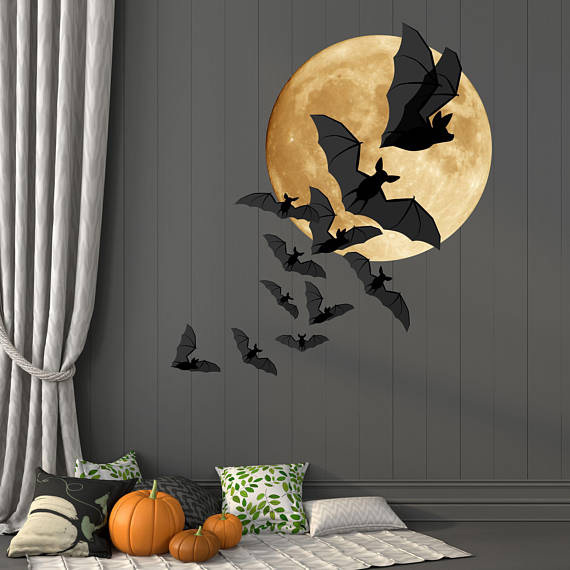 Bats are the ultimate Halloween decor. Mix in a full moon and your house or office suddenly looks the part. You can make your own design with these removable vinyl decals and create a Halloween effect with little effort. 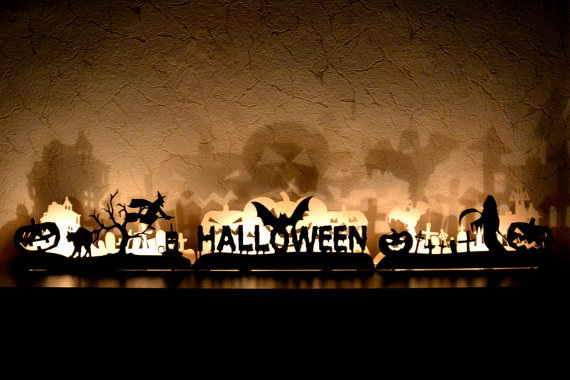 Silhouette decor is the perfect choice to create a tabletop or mantel arrangement or as a dramatic windowsill display. Place a candle in the center of these wooden pieces and enjoy a multi-layered show of lights and shadows. There is nothing that says celebration like banners. Having turned into an universal symbol for parties and festivities, banners can be easily adapted to your style. Whether you are going for scary or for elegant, there is a banner out there for you. Here is, for example, a Halloween star banner that you can easily customize. 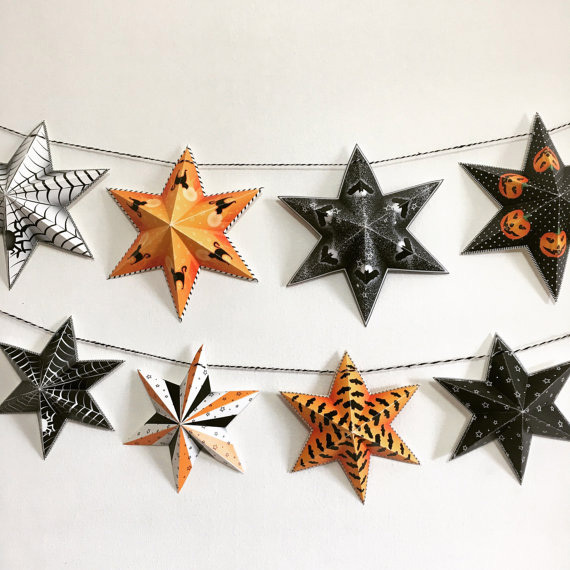 All you have to do is print, cut and fold the stars of your choice to create a fast yet dramatic piece of 3-D decor. 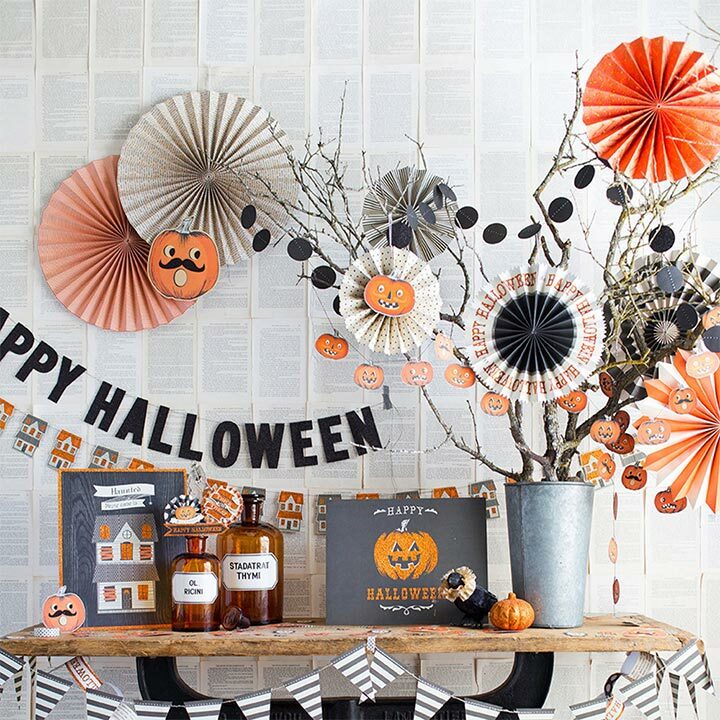 If you are going for a more delicate and elegant look, choose a banner that borrows from the colors of the season without the Halloween imagery. 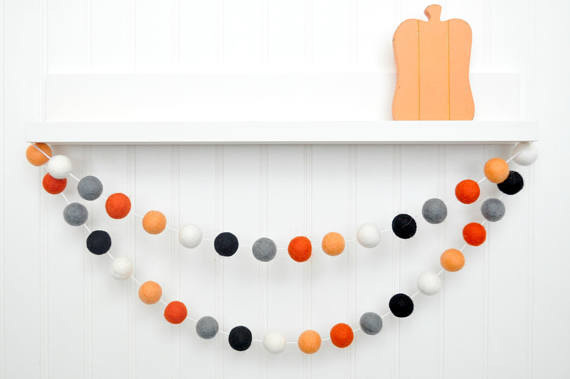 This felt ball banner is the right choice for the minimalist decorator and for a space in need of extra texture. To go big, choose a decor kit that covers it all. Banners, mini banners, party fans, party picks and some pieces of standing art are more than enough to loudly spell Halloween. 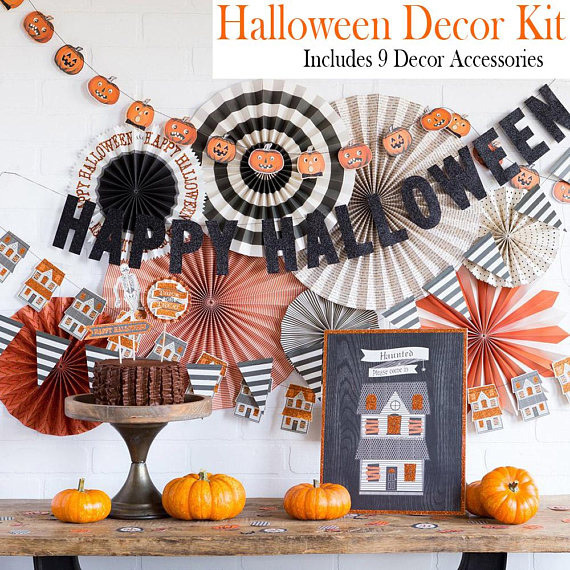 Throw in some confetti (included in this kit) and you got yourself a perfectly coordinated Halloween decor. If a Halloween table is part of your end-of-October plans, start gathering a few black elements, then balance them with some high-contrast color. If you have a black tablecloth, perfect. 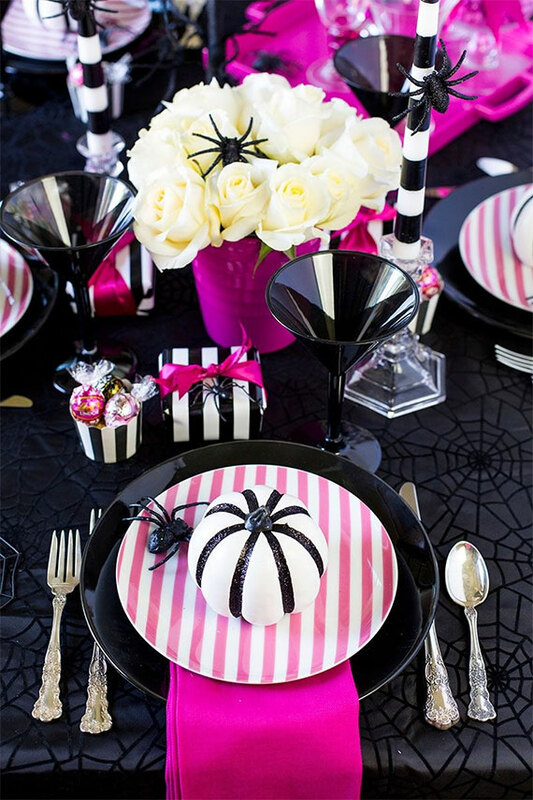 If not, a few spiders strategically placed on the table can turn any table setting into a Halloween one. As for Halloween treats, here is an ingenious take on an old idea: the “poison” toffee apples, as dreamed up by Simply Delicious. 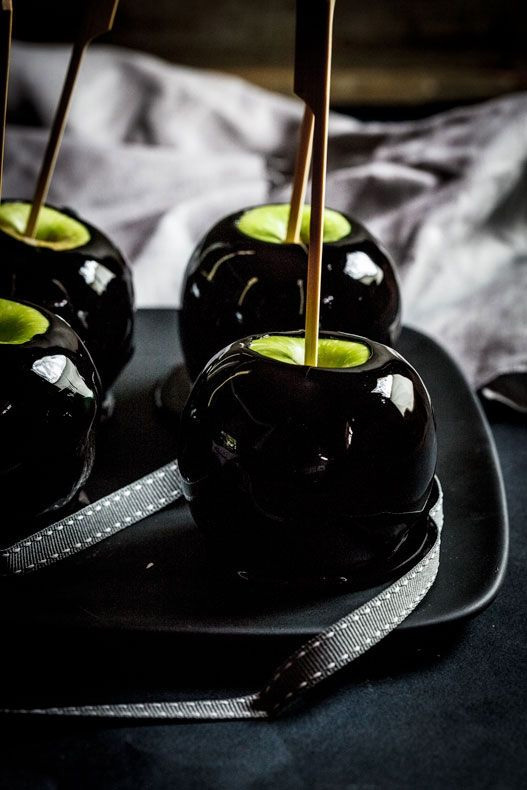 A combination of sugar, water, corn syrup and food coloring gives these apples a new Halloween look. In fact, they turn out so beautiful, you may decide to save them and use them as decor.